We took Olivia apple picking last year and she loved it. We couldn't wait to take her again this year, and I'm happy to report she loved it just as much, if not more. I think it's safe to say picking at Apple Holler is going to be a family tradition. It's only about an hour and a half drive from the city which makes it really manageable. In addition to their amazing and delicious apples, they have some really incredible baked goods (we love the apple cider donuts! ), a restaurant, corn maze, pig races, goats to feed and a few other small attractions. 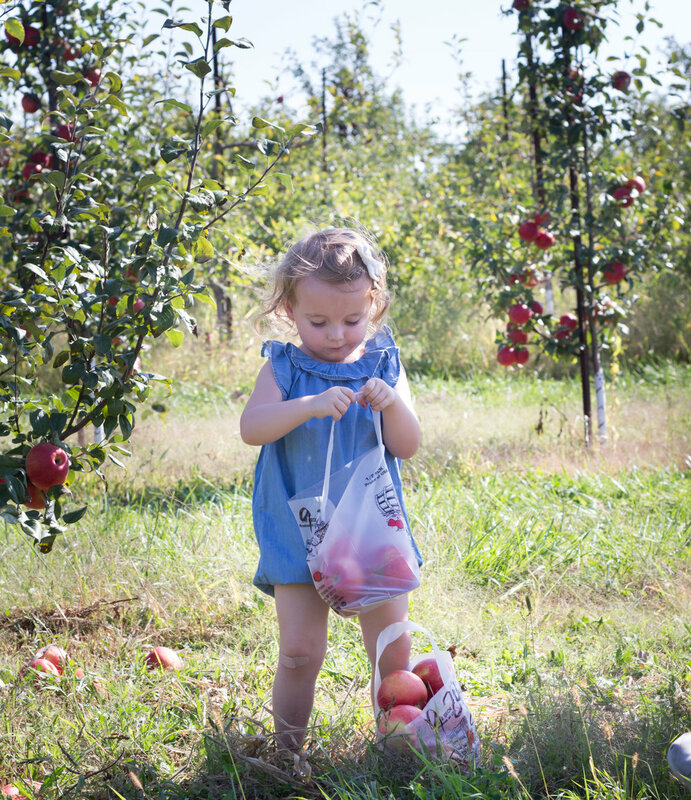 Honey crisps are our favorite so we always go during this time of the picking season. It was SO hot on Sunday- 90 degrees! We didn't quite snap as many pics as I thought we would (you know, sticky and sweaty and all!) but we really had a great time. Olivia just kept wanting to pick more and ate her little heart out all along the way. I live for making memories like this. And I love the opportunity to create traditions that will be something our family does for years; that she'll be able to look back on fondly when she's older. A beautiful, thoughtful, intentional, happy (and healthy!!) childhood is my biggest priority. If you haven't gone apple picking yet, I really recommend it. It's such a fun experience. What are some of your favorite fall traditions?